MIT Administration "Walking the Talk"
Teaching this fall? You should know . . . I had the following dream the other night. I was getting my 10-year-old daughter ready for school. School was important: an education was the only pathway to a better future for her. She showed me her homework from the night before. I thought it was well done, though I couldn’t understand most of the words. It was hard to have my child being taught in German. Of course this was my educational background too, but things fade; I never really learned to speak the language. On the other hand, I never really learned to write English either, or read it fluently, since it was not taught in school. Maybe it didn’t matter, since there was so little literature published in English. And of course it really wasn’t fair to expect the school to teach – mathematics, say – in English, since all the published textbooks were in German. This is the way it’s always been. It was always hard for me to express myself in German, and the school rarely asked more than rote learning. I’m sure that this is the case for my daughter as well. But after all, most courses are taught in this language. I gave my daughter a hug and sent her on her way. Luckily, this dream of mine is fictional. But this is exactly the nightmare faced by almost all Haitian parents today, with the German of the dream replaced by French and English by Haitian Creole (“Kreyòl”). All Haitians speak Kreyòl, while less than five percent speak French at home. Both are official languages, but there are great impediments to using Kreyòl in educational settings. And very often the teacher is insecure with his or her own French. A further tragedy is that most literate Haitians are insecure about writing in Kreyòl also, because until quite recently Kreyòl orthography was rarely taught in schools. In a sad affirmation of the status quo, it is widely held that deep or technical ideas cannot be expressed in this language. The use of French as a language of instruction in Haiti is inextricably linked with a reliance on a conservative teaching methodology at all levels. It’s often said by teachers that they speak Kreyòl when they want their students to understand and participate, and French when they want them to obey and keep quiet. An ongoing initiative based at MIT is helping to provide training and resources for higher education that are founded on contemporary educational theory and active learning methods, and, as a consequence, predicate the use of Kreyòl in the classroom. My own association with this initiative has been among the most rewarding experiences in my career at MIT, and I think I speak for all the participants in the project in thanking Professor Michel DeGraff for his passionate and visionary leadership. In this brief article, I’d like to report on this initiative. A founding symposium was held at MIT in October 2010, at the Cambridge Marriott Hotel. Convened by Professors Michel DeGraff and Thomas Kochan (then Chair of the Faculty) along with Vijay Kumar (then Director of the Office of Educational Innovation and Technology), it drew a highly distinguished group of Haitian academicians, including a former prime minister (Michèle Pierre-Louis from the FOKAL Foundation in Haiti which co-sponsored the symposium), deans from the Faculty of Sciences at the State University of Haiti, and rectors or presidents from a number of public and private institutions, as well as high-tech industry and telecommunications representatives. The relationships and plans forged by this conference led to the first MIT-Haiti workshop, in Port-au-Prince, in March 2012. This pilot led to a substantial grant from the U.S. National Science Foundation, with Michel DeGraff and Vijay Kumar as Principal Investigators, which has funded a very active program of engagement between MIT and Haitian faculty. The focus has been on fostering active learning in Haitian higher education, supported by technology and the use of Kreyòl. A main element of this collaboration has been a series of workshops – eight, so far. They have reached some 263 Haitian faculty and administrators, with around 100 attending more than one of them. They have a standard format: three or four days; lectures in the morning on modern educational theory, active learning methods, and lesson design, followed by disciplinary sessions in the afternoon in which active learning strategies are exemplified, discussed, and then created by the participants. Sessions have been conducted on biology (highlighting the StarBiochem and StarGenetics tools), mathematics (highlighting the MIT Mathlets and GeoGebra), statistics, physics (using PhETs and hands-on kits), and chemistry and bio-chemistry. Sometimes a panel of Haitian educators or academic administrators discusses examples of effective teaching strategies or educational initiatives. One of the outcomes of these workshops is a convincing demonstration that there is no real obstacle to conducting technical discussions in Kreyòl. Along the way we have been contributing to the glossary of technical terms in the language. In September 2015, six of the most committed Haitian participants spent two weeks at MIT. They enjoyed a rich program of talks and classroom visits, and worked on syllabus enrichment. When they returned to Haiti, five of the six formed a “Konbit” – a Kreyòl term for an agricultural practice common in Haiti as it was in an earlier era in the U.S., in which neighbors cooperate to work their various fields. The Konbit immediately ran a series of workshops in Haiti, amplifying the work of the MIT team. We regard the Konbit initiative as a mark of the coming of age of the MIT-Haiti Initiative. The MIT-Haiti Initiative has recently broken new ground, establishing a collaboration not just with individual academics but rather with an institution. In August 2015 we ran a workshop at the Campus Henri Christophe of the State University of Haiti. This is a newly built and very attractive university campus near a town picturesquely named Limonade, not far from Cap Haïtien in the north of the country. Following that workshop, the president of this university applied for and won a grant from the U.S. Embassy in Haiti to fund a further workshop, followed by a week of intensive engagement by the MIT team with the Limonade faculty. This visit occurred in June 2016. We established close relationships with much of the faculty at this campus, and look forward to continuing our involvement with them. We are involved in a proposal to create a center of pedagogy at that institution, for which we would serve as consultants. The MIT-Haiti Initiative has several other components. Michel DeGraff has a longstanding relationship with Lekòl Kominotè Matènwa, a Kreyòl-based K-10 school in rural Haiti (on the island of Lagonav). He has conducted research there demonstrating a strong correlation between reading comprehension and the use of Kreyòl in the classroom. The Konbit visited this school in February 2016 and conducted a workshop with its faculty. More than 200 million children worldwide are being “educated” today in a language that they don’t speak, and 40% of the world’s population (more than 2.3 billion people) speak languages that are still marginalized at school. The MIT-Haiti Initiative is forging a model of the use of local languages such as Kreyòl as the primary language of instruction at all educational levels. We believe that this is not only desirable from a pedagogical perspective, but actually necessary for the psychological and cultural wellbeing and the socio-economic and political advancement of large sectors of the world’s population. The Haitian example is particularly poignant. In many cases the marginalized local language is spoken only by a very small group or fragment of the population. Haitian Creole on the other hand is spoken by all 10 million Haitians. It is a unifying language, and as such it offers a tremendous national resource, one so far underutilized. 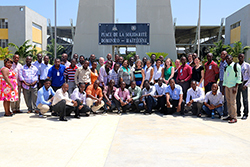 Click here to see a list of the MIT participants in the MIT-Haiti workshops. For more information about the MIT-Haiti Initiative, please visit the Website haiti.mit.edu. We welcome your participation in this ongoing international engagement. Editor's Note: Click here to read a Kreyòl translation of this article.